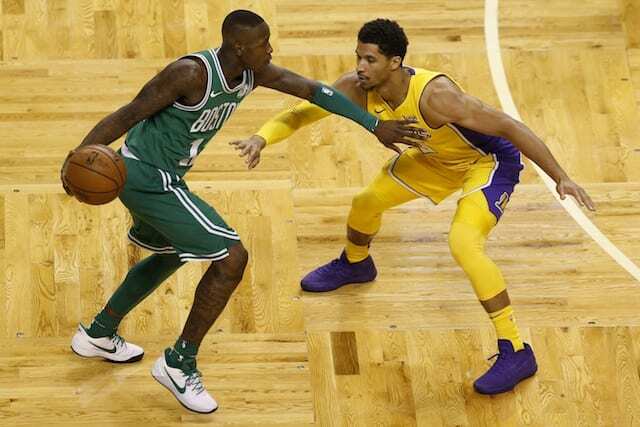 The Wednesday clash between the Boston Celtics and Los Angeles Lakers had a certain energy to it, different than in recent years. With Kyrie Irving and Lonzo Ball clashing for the first time on their new teams. With both teams making upgrades in the offseason to better their future, it made for an interesting matchup. 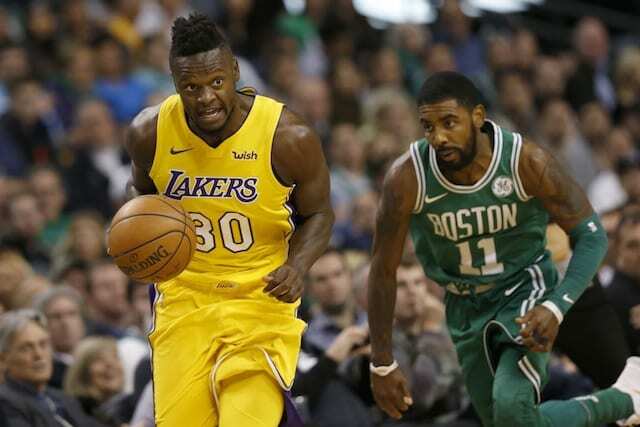 Boston entered the matchup with the longest winning streak in the NBA in nine games, while the Lakers were coming in with impressive consecutive victories over the weekend. One winning streak had to give, with the Celtics hearing the unfortunate news that Al Horford entered the concussion protocol and will not suit up. 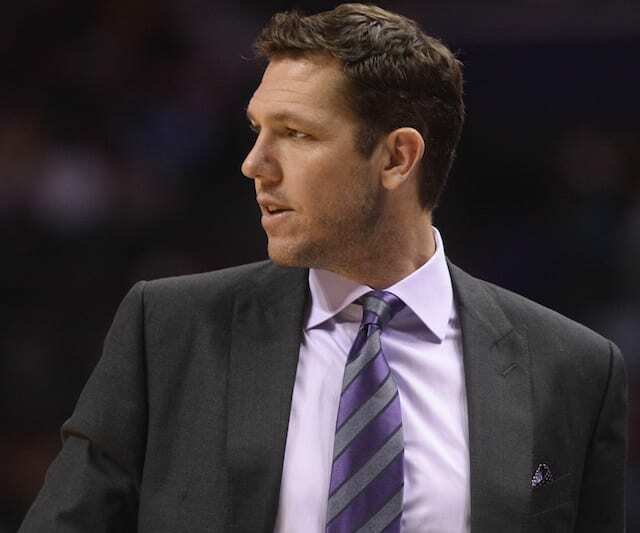 Head coach Luke Walton started off the 11th contest of the season with his usual starting lineup of Ball, Kentavious Caldwell-Pope, Brandon Ingram, Kyle Kuzma, and Brook Lopez. Brad Stevens countered with Irving, Jaylen Brown, Jayson Tatum, Marcs Morris, and Aron Bynes. The TD Garden was filled with the usual loud fans, as the opportunity to watch the Celtics and Lakers comes only once a season until the day these historic franchises once again meet in the NBA Finals. With a national telecast on ESPN, the Celtics came ready and played hard to the getgo, which created a difficult scenario for the Lakers. In the midst of a difficult road trip, Los Angeles started out careless with a series of turnovers, showing a bit of nerves. At the same time, the Celtics attacked the basket and attempted to capitalize in the paint. Irving was able to dice up the defense for a spectacular finish at the rim, which brought the crowd to their feet. Lopez was able to scratch for the first Lakers bucket of the night, with a favorable matchup against the Horford-less Celtics. The theme to the success of this Lakers team all season has been their approach on the defensive end, surprising much of the NBA with their top-10 defensive play. As the rallying cry of Walton this training camp, Los Angeles would only go as far as their defense would take them. The Celtics opened up a double-digit lead about halfway into the first quarter, with the Boston big men getting open opportunities close to the basket. Their cold start on offense also didn’t help their cause, with a series of questionable passes and decisions. Kuzma, Jordan Clarkson, and Caldwell-Pope each missed their first few shots into the game, forcing the issue. The horrid end to the first quarter was capped off by a bad offensive possession, which turned into a buzzer-beating heave from way beyond the arc for Terry Rozier. At the end of the first quarter, the Lakers trailed 33-16. With his team down double digits, Walton didn’t have many other options than to give his bench an opportunity to slowly crawl back into the game. The unit, led by Randle, slowly started to cut into the lead as the quarter progressed. Randle was able to strip Daniel Theis at the top of the key for a transition slam dunk that sparked the bench. Ball was able to respond to a basket from Irving by driving coast-to-coast, weaving between Celtics for a floater in the lane. Caldwell-Pope also began to find his shot in the second quarter, knocking down a four-point play on a silly foul from Irving. He then really got hot when he hit a corner three shortly after, which gave Los Angeles some momentum to build off of. At the same time, Celtics were getting cold on offense, apart from a few fortunate plays. Although Los Angeles outshot and hit more three-pointers than the Celtics, they lost the turnover battle 12-6. The Lakers were able to outscore the Celtics 36-28 in the second quarter, trailing 61-52 going into halftime. Ingram led the way with 11 points, while Randle chipped in 10 points, seven rebounds, and two assists. Both teams came out ready to play to start the second half, including an improved approach for both defenses. Caldwell-Pope, Ingram, and Clarkson were active in the passing lanes, each getting steals. The pace of play picked up with both teams in transition, which benefitted the Lakers. While his players were fired up on the court, Walton was steaming on the sidelines, constantly in the ears of the officials. That eventually resulted in a technical foul, which sort of served as a wake-up call to his team. The Lakers chipped at the lead and dropped it down to below five, capped off by a well-executed pick-and-roll, resulting in an open dunk for Lopez. Lopez collected his third block of the game after swatting an Irving floater in the lane. The transition opportunities were available, as Ingram continued to set the offensive tone with 16 points on 6-for-10 shooting. Ingram then drove hard to the basket and used two long strides to scoop and score at the rime. That dazzling play was followed by another, as Clarkson switched hands halfway up for an acrobatic finish to bring the team within two points. Randle seemed to be an extra spark that normal, especially with him not seeing much action in the first quarter with Andrew Bogut taking his minutes. He was able to clean up a missed shot around the rim, gathering himself through multiple Celtics defenders for the three-point play. Once again, the Lakers chipped at the lead by outscoring the Celtics by three points and only trailing 87-81 going into the final quarter. Clarkson reached a total of 14 points, while Caldwell-Pope had 12 points, three rebounds, and three assists. Clarkson was able to get the Lakers scoring going in the final frame, converting two of three free throws and recovering the miss for an offensive rebound. 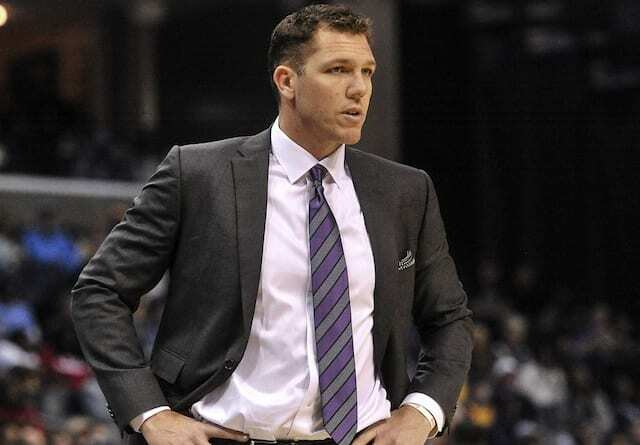 Walton had to be pleased with his team’s aggressiveness on offense, telling them during a timeout that the only way they would win was as a team. They were getting multiple defensive stops, but were having difficulty converting on the offensive end. The Celtics were giving the Lakers multiple chances to come back into the game, but Los Angeles was having trouble taking advantage. It took a tough three-point play from Randle to get them going, as both teams only scored a bucket apiece three minutes into the quarter. Clarkson was once again able to stay with his shot following a miss, getting a tip-in for 18 points on the night. However, the Celtics responded with a three-pointer from Marcus Smart to extend the lead to 94-88. A Kuzma mid-range jump shot was able to again bring the lead down to six, with the Lakers having trouble finishing off possessions with a rebound. With 14 offensive rebounds, the Celtics were able to convert their second-chance opportunities to limit the spurts from Los Angeles. After losing Gordon Hayward for the season, the Celtics now only had one true option to finish in the clutch, especially with Horford out. Irving was able to finish a tough shot, also hitting a beautiful spinning fadeaway for the bucket. Ball was able to finish in the paint with his left hand, beginning an interesting stretch. He was also able to block Irving’s drive to the basket, for his third block of the night. Ingram was able to convert a tip-in dunk that brought the Lakers to within eight. 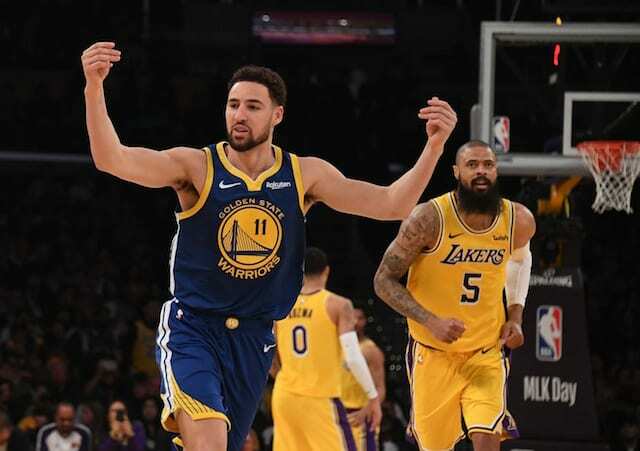 The struggle on the offensive boards and inability to capitalize on chances ultimately haunted to the Lakers, as they couldn’t put together the final run they needed. Irving and Baynes were able to put a stamp on the Celtics win, as Baynes finished with a career-high 21 points and eight rebounds. The lead for the Celtics opened up as the Lakers tried to climb back in, with the Celtics finishing the game with a 107-96 victory over the Lakers. Ball finished the game with nine points, six assists, five rebounds, and four blocks. Ingram also had 18 points, seven rebounds, and two steals, while Randle has 16 points and 12 rebounds in 21 minutes.